I had wanted to replace our dish sponges with something more sustainable. Conventional sponges are derived from oil based products and those with anti-bacterial can have tons of chemicals. Plus sponges harbor bacteria so easily and need to be thrown out regularly which creates more plastic waste. 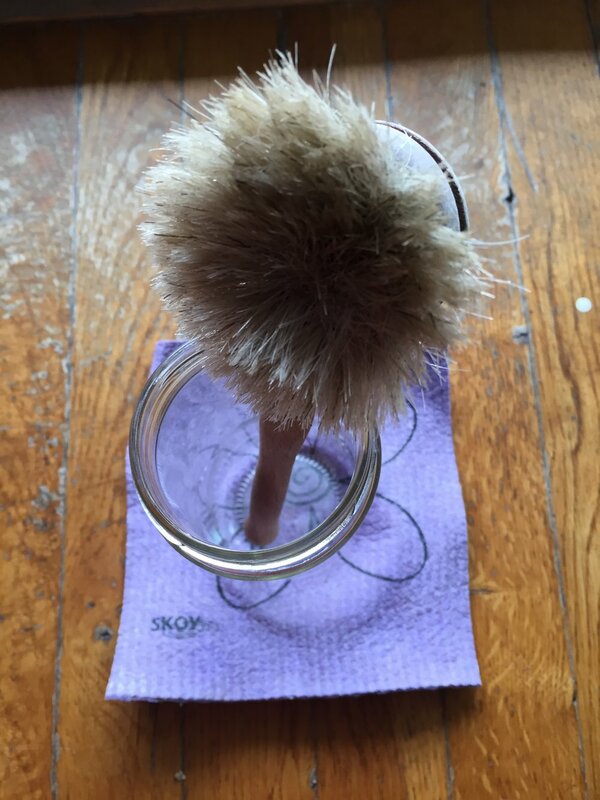 I did some research and found that a wooden dish brush may be the answer. I've always used regular sponges so getting and using this was a new experience. I don't have a dishwasher, in fact, my parents really didn't believe in it. I mean, we had one but it was used as a drying rack so every since my husband moved into our current apartment 5 years ago, we have been hand washing our dishes. I have been using the Gute Dish Brush for almost 3 weeks with the EcosDish Soap. Since we have been on whole30, we cook more and more at home which means the cycle of dishes is practically non-stop. This product has been independently used and reviewed by me. No compensation was received from the maker of this product. This post contains affiliate links. Read Disclosures for further info. Definitely good for lighter stains. Great for plates, cups, mugs and utensils. I would not recommend it directly on pots and pans. I usually scrub caked on grease and food with a separate brush before using this brush. The brush head has stayed intact despite the many uses in the last 3 weeks. I've left this in the sink and inside the dish container a few times under water (by accident) and it's been ok so far. The wood is starting to discolor a little bit, but the brush hairs appears to be fine and I have not noticed a difference in it's cleaning power. 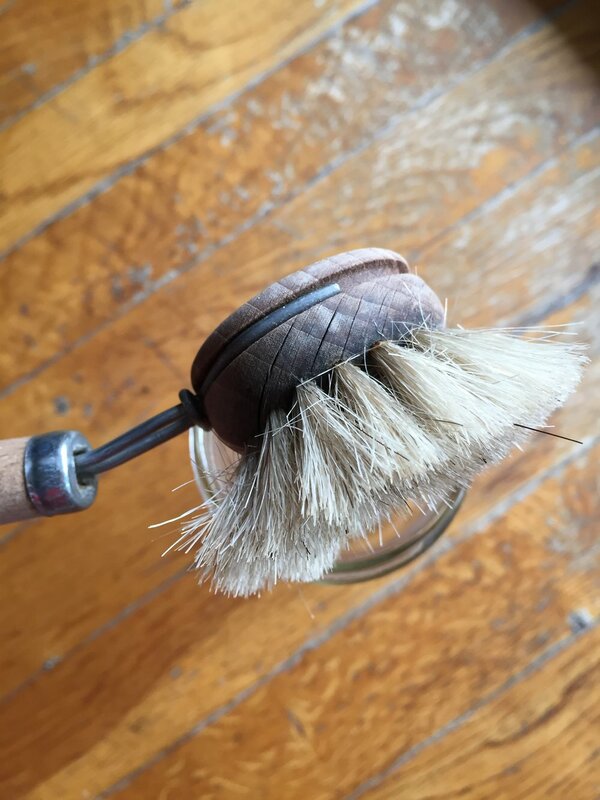 The brush is made of horsehair and the handle is made of untreated beechwood. The brush can be replaced and composted though I have not tried to compost this yet. You can get replacement brush heads online. I did a test burn on a few hairs to confirm it wasn't plastic and it burned like hair so thumbs up there. 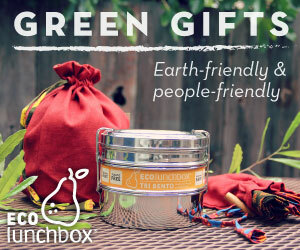 I sometimes get weary of buying things online because there'sa lot of "green marketing" happening. I ordered these from Amazon. It came wrapped in plastic. Boo! Around $11 for one dish brush. Yes, it is definitely more expensive that your average sponge, but you are exchanging it for the standard product that is made of plastic. Compare to some of the other products that may not compost and biodegrade properly. 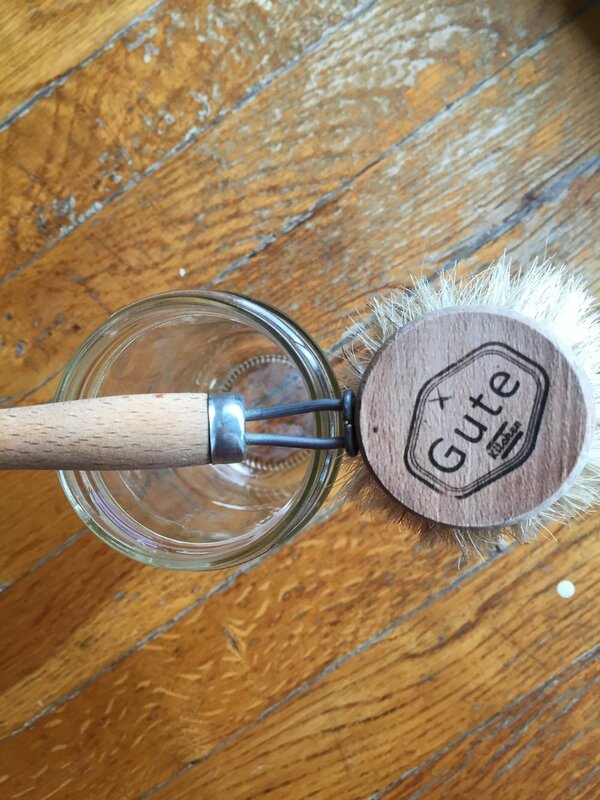 I bought this one on Amazon Gute Beautiful Soft Horsehair Bristle Dish Brush or you can get it at Gute Kitchen. I have not found this in a local store yet. I originally found the Bürstenhaus Redecker type of brush via Life Without Plastic, but it has been sold out for a few weeks now and I just couldn't wait. I was using up our last sponge and it was getting nasty. So this review is based on the Gute brush, but have heard similar good things about the Bürstenhaus Redecker as it has stiffer bristles. Gute Horsehair Dish Brush packaged in plastic as it arrived from Amazon. Brush head is a great size and fits in most of my jars for easing cleaning. After a few uses, but it held up despite turning color early on. This is a buy for me for normal grease. It does get the dishes clean and glasses come out without any water stains. Plus, I don't have to touch the icky sponge when I wash the dishes. I do find myself making sure I dry it out to preserve it since it is very nice looking. Pair this with a good scrubber though for the heavy duty pots and pans. I started using this particular brush since June. It's now October and it is still holding up. No smell, no torn brush hairs. The brush head remains intact. There is some slight discoloration which I believe is due to a few times it sat in water, but overall still in excellent condition and I am very happy with the job that it has done. I use it everyday with Seventh Generation Natural Dish Liquid since we don't have a dishwasher. The pictures above were taken three weeks into using it in June. The pictures below were taken in early October. Pair this with the Skoy Cloths to reduce paper towel waste. Full review here.